Buddhist Treasure Vase Tattoos - The Treasure Vase - known also as the 'wealth vase' - and 'vase of inexhaustible treasure' - became the Buddhist symbol of spiritual abundance. As one of the Eight Auspicious Symbols of Buddhism, it represents not only the wealth of Buddha's teaching but his never-diminishing generosity and compassion. Legend attributes to it a special quality, that of always remaining full despite much being taken from it. Here is a tattoo design for the eternal optimist. Wearing this design serves as a declaration that here stands a true believer in the benevolence of existence. 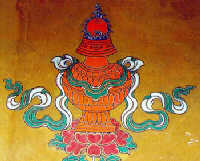 Other symbols often decorate the Treasure Vase, usually the lotus petal emblem and sometimes the Three Jewels which symbolize the Buddha, the Dharma, and the Sangha. As a motif woven into silk brocades, for example, it usually appears as a pair of vases. The symbol also shows up in carpets, wood carvings and wall paneling, usually in conjunction with other of the Eight Auspicious Symbols. 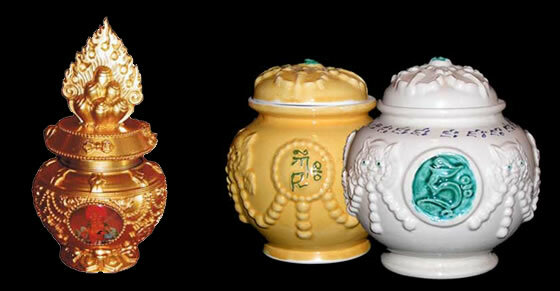 In Tibetan Buddhism, the Treasure Vase is also a symbol of protection displayed when undertaking special activities. Visiting dignitaries may be welcomed with the Treasure Vase design drawn in coloured powder sprinkled on the ground. Although the Treasure Vase we are describing is Buddhist, it is based on the traditional clay water pot from India, which is fat-bellied with a short slender neck and fluted rim. At the opening, a large jewel was placed to indicate that it was a 'treasure vase'. These pots became known as 'wealth vases' when they were filled with precious jewels and other sacred substances and the vases were placed on temple altars or at water sources to attract wealth and to create environmental harmony. Another attribute of the Treasure Vase is its quality of 'spontaneous manifestation'. On special occasions involving ritual offerings, a vase was made of gold and referred to as the 'Great Treasure Vase'. It was studded with jewels and adorned with a silk scarf tied around the neck. The top was sealed with a 'wish granting tree', the roots of which grew to permeate the water in the pot, and were believed to miraculously produce a profusion of treasures, one of which was longevity. 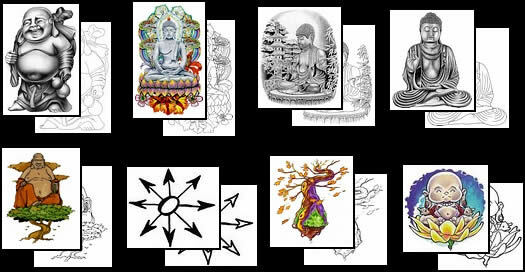 Choose your own Buddha Tattoo Design by the world's top tattoo artists to buy the perfect Buddha design for you.